TULSA, Okla. – Oklahoma-based Manhattan Construction Group, a top nationally ranked construction firm, is expanding its civil, road and bridge construction operations to include pipeline construction services. The firm announced today it has acquired Danny Wright Dozer & Pipeline, Inc. (DWDP), a pipeline construction firm based in Hinton, Oklahoma. The newly acquired operation will be known as Manhattan Pipeline, LLC. DWDP was originally formed in 1990 by Danny Wright. The firm has 90 employees. Employees will be offered the opportunity to transition to Manhattan Pipeline. 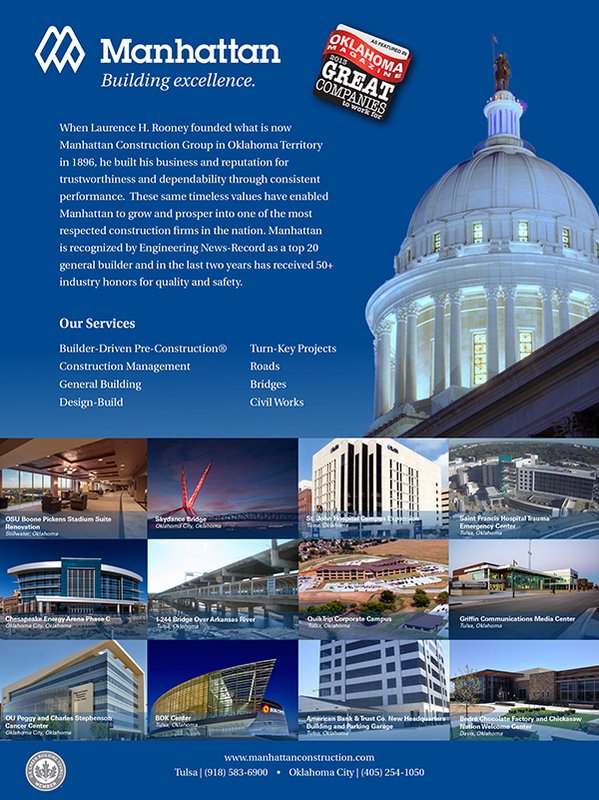 When Laurence H. Rooney founded what is now Manhattan Construction Group in Oklahoma Territory in 1896, he built his business and reputation for trustworthiness and dependability through consistent performance. These same timeless values have enabled Manhattan to grow and prosper into one of the most respected construction firms in the nation. In last two years Manhattan has received 50+ industry honors for quality and safety. The company’s services include Builder-Driven Pre-Construction®, construction management, general building, design-build and turn-key projects, roads, bridges, pipeline and civil works. Manhattan works in the U.S., Mexico, Central America and the Caribbean. For more information about Manhattan, please visit: www.manhattanconstructiongroup.com. Learn more about his project at the Houston Football Stadium website. DALLAS – Manhattan Construction Company has won four “2013 Best Project” awards from Engineering News-Record (ENR) Texas & Louisiana, including the top honor of overall “Project of the Year” for construction of the George W. Bush Presidential Center in University Park, Texas. BBVA Compass Plaza in Houston, Texas in the Office/Retail/Mixed-Use Developments category. Project owner: RS Post Oak Perennial, LP (The Redstone Companies). 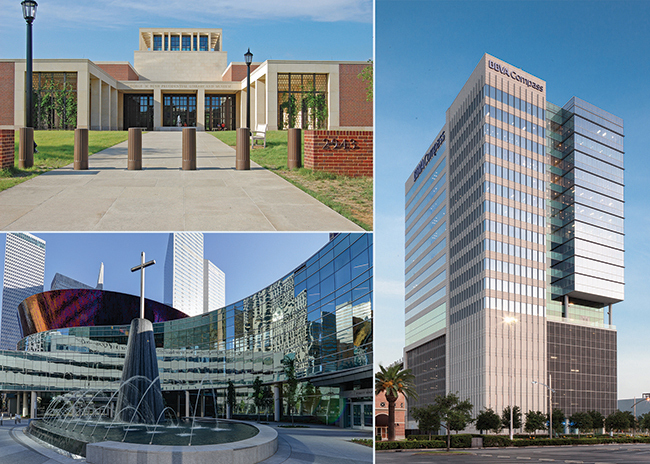 Project architect: HKS, Inc.
First Baptist Church Dallas in Dallas, Texas in the Cultural/Worship category. Project owner: First Baptist Church Dallas. Project architect: Beck Architecture. George W. Bush Presidential Center in University Park, Texas in the Higher Education/Research category. Project Owner: George W. Bush Foundation. Project architect: Robert A.M. Stern Architects, LLP. Project landscape architect: Michael R. Van Valkenburgh and Associates. The ENR Texas & Louisiana Best Projects awards program recognizes top construction projects that best demonstrate innovation, exceptional quality and an ability to find creative solutions to daunting challenges. More than 80 entries were submitted representing projects completed in Texas, Oklahoma, Louisiana, Arkansas and Mississippi. The honors were presented to Manhattan team members at ENR’s awards luncheon on December 18, 2013 at the Renaissance Dallas Hotel. When Laurence H. Rooney founded what is now Manhattan Construction Group in Oklahoma Territory in 1896, he built his business and reputation for trustworthiness and dependability through consistent performance. These same timeless values have enabled Manhattan to grow and prosper into one of the most respected construction firms in the nation. The firm’s operating companies are Manhattan Construction Co., Cantera Concrete Co. and Manhattan Road & Bridge. Manhattan is recognized by Engineering News-Record as a top 20 U.S. domestic builder and in last two years has received 50+ industry honors for quality and safety. The company’s services include Builder-Driven Pre-Construction®, construction management, general building, design-build and turn-key projects, and roads, bridges and civil works. Manhattan works in the U.S., Mexico, Central America and the Caribbean. For more information about Manhattan, please visit: www.manhattanconstructiongroup.com or connect with us on twitter @ManhattanBuild, via Facebook/ManhattanConstruction and on LinkedIn. 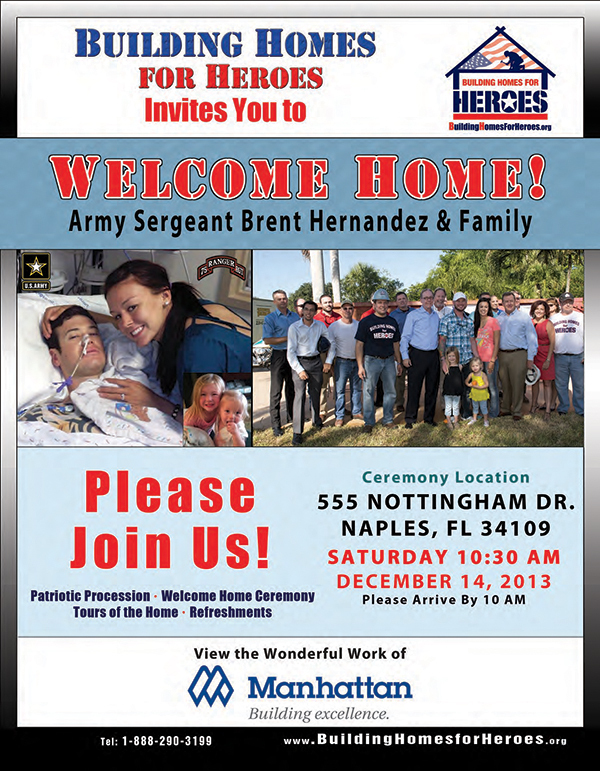 Naples, Fla.- Just in time to celebrate the holidays, Army Sergeant Brent Hernandez, his wife, Katy, and two children will move into their new, custom-renovated and mortgage-free home on Sat., Dec. 14. Building Homes for Heroes, a national non-profit, non-partisan 501(c)(3) organization, and its partners, Chase bank and Manhattan Construction, will host a homecoming celebration for the Hernandez family at the family’s new home located in Naples, Fla., marking the organization’s 17th new or renovated, fully-financed home donated to severely wounded or disabled soldiers in 2013. Sgt. Hernandez was deployed to the Zabuil Province of Afghanistan with the 75th Ranger Regiment on March 28, 2010. A mere 13 days into his deployment, Hernandez was severely wounded when his aircraft, an Air Force CV-22 Osprey tilt-rotor, crashed. The pilot, flight engineer, an Army ranger, and a civilian contract employee were killed, while 16 others were wounded. Hernandez, who was unconscious and suspended by his safety line, sustained critical injuries including ripped intestines through his abdominal wall, three small bowel resections, two traumatic hernias, oblique muscles ripped in half and separated from his spine, three fractured ribs, a collapsed lung, two fractured vertebras, traumatic brain injury, and post-traumatic stress disorder. During his service, Sgt. Hernandez earned the Army Achievement Medal, Good Conduct Medial (2x), National Defense Service Ribbon, Global War on Terrorism Ribbon, Army Service Ribbon, Army Ranger Tab, Combat Infantry Badge, and the Army Parachutist Badge. Locals are invited to attend Sgt. Hernandez’s homecoming celebration, where he and his family will be recognized for their tremendous dedication along with the organizations and volunteers who contributed to the home’s renovation. Following a procession and formal ceremony, Sgt. Hernandez will be presented with the keys to enter his new home that supportive community members and volunteers have even decorated for the holidays. 2013. The organization is on track to donate 25 homes in 2014. We are honored to have been featured in Oklahoma Magazine’s December issue as a 2013 Great Company To Work For! For information on all Manhattan Construction locations click here. For information about careers at Manhattan Construction click here. GRAND RAPIDS, MI – Erhardt Construction and Manhattan Construction Co. are commemorating this Veterans Day by celebrating local veterans involved in the construction of the new Veterans Affairs Outpatient Clinic project. Local Michigan-based Erhardt Construction is working with top-tier national contractor Manhattan Construction Co. to build the new Department of Veterans Affairs (VA) Community Based Outpatient Clinic in Wyoming, MI. Manhattan is serving as construction manager and Erhardt is providing general contracting services for the project. 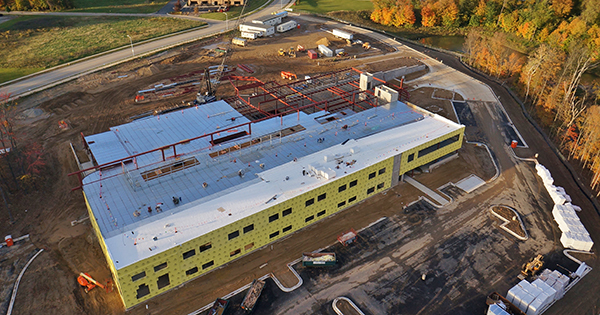 Situated on the campus of Metro Health Village at 5838 Metro Way Street in Wyoming, the new clinic will be a two-story 126,500-square-foot facility that will provide outpatient services for nearly 18,000 Veterans annually in the West Michigan area. The modern facility will replace the current VA Clinic located on Grand Rapids northeast side. Currently, the clinic operates in a 64,000 square feet facility, with about 35,000 square feet of clinic space. The new clinic will almost triple the size of the facility and expand services available for the increasing number of veterans in the area. That includes offering primary care, mental health, dental, radiology, and physical therapy services that are not now offered at the Grand Rapids location. Erhardt and Manhattan are also celebrating the local veteran community the facility will serve, as well as the veteran workers who are currently on site at the facility. This Veterans Day we hold the local veterans and the new clinic that will serve their healthcare needs in high regard. We celebrate the facility and our veterans who currently work on the project. “I feel the level of satisfaction that comes with performing a job well done is amplified on this project because everyone involved knows this facility will service the fine men and women veterans that do so much for our great country” said Robert O’Connor, Manhattan Construction project manager. Don Resler, an employee at Erhardt Construction, is working on the clinic as an assistant superintendent. Resler served from 1969-1989 in the military police and as a drill sergeant, in many parts of the world including Korea, Germany, and Vietnam. Resler has been with Erhardt since 1996, and was planning on retiring until he was asked to work on the Veteran Affairs Clinic. Working on a facility that will serve fellow veterans is being held in high reverence by Resler, holding off retiring until after the project is complete. Dave VanderHyde, another Erhardt employee, came out of retirement for a three-month period to supervise a portion of construction. VanderHyde worked at Erhardt for 33 years before retiring, and served in the Army with a tour in Vietnam during his 1971-1973 duty. “The biggest thing that drew me out of retirement was the opportunity to help build a facility to serve fellow veterans” said VanderHyde. The Veteran Affairs Clinic will be the last project of their careers. “It feels like we are going somewhat full-circle, from serving our country to building a facility that will serve the healthcare needs of others who bravely serve” said Resler. We are honored to be part of a project that will serve our local veterans. These men and women are heroes, and we are humbled and honored to be part of a project that will provide them with care for many years to come. To think about the heroes that will be walking through these doors and the sacrifices they’ve made for our country is truly impactful. It makes you feel like you’re building a lot more than a building” – Ben Wickstrom, President of Erhardt Construction. Last month, the contractors held a ‘Topping Out Party’ to signify the last piece of steel placed. A barbeque lunch was served to the jobsite workers, team members, and staff of the VA Clinic. During the celebration, the subcontractors and project team made donations to the Wounded Warrior Project. Ground was broken in April 2013, and the project is scheduled to finish in November 2014. When Laurence H. Rooney founded what is now Manhattan Construction Group in Oklahoma Territory in 1896, he built his business and reputation for trustworthiness and dependability through consistent performance. These same timeless values have enabled Manhattan to grow and prosper into one of the most respected construction firms in the nation. The firm’s operating companies are Manhattan Construction Co., Cantera Concrete Co. and Manhattan Road & Bridge. Manhattan is recognized by Engineering News-Record as a top 20 U.S. domestic builder and in last two years has received 50+ industry honors for quality and safety. The company’s services include Builder-Driven Pre-Construction®, construction management, general building, design-build and turn-key projects, and roads, bridges and civil works. The company works in the U.S., Mexico, Central America and the Caribbean. For more information about Manhattan, please visit: www.manhattanconstructiongroup.com or connect with us on twitter @ManhattanBuild, via Facebook/ManhattanConstruction and on LinkedIn. DALLAS – Please join us in congratulating Manhattan Construction’s Executive Vice President Bob Bowen for being honored with the Boy Scouts of America Construction “Good Scout” Award. The Longhorn Council of Boy Scouts of America will present the award to Bowen at a luncheon held in his honor on November 8th, 2013 at the Hyatt Regency at the DFW Airport. The Construction “Good Scout” Award is bestowed to one individual in the construction industry each year known for his or her strong character and contribution to the community. Bowen is a founding board member of the Construction Industry Outreach Advisory Council (CIOAC), a non-profit association committed to the promotion of diversity in construction and industry advocate for the future workforce. He previously served on the board of the Dallas Architectural Foundation, UT Arlington – College of Architecture, Construction Education Foundation, Dallas Capital Improvement Board, TEXO (Associated Builders & Contractors, and Associated General Contractors) and Construction Management Association of America (CMAA). At Manhattan Construction, Bowen provides executive oversight for offices in the south and southeast U.S. He began his construction career with Manhattan in 1981. Prior to his current role, he was senior vice president of the Dallas office serving North Texas which has built several high-profile projects including The George W. Bush Presidential Center, The Ritz Carlton Hotel and Residences, Cowboy Stadium, The Ballpark in Arlington, Prestonwood Baptist Church and First Baptist Dallas. 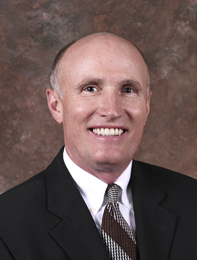 Bowen earned his bachelor of science in building construction from Texas A&M University in 1981. When Laurence H. Rooney founded what is now Manhattan Construction Group in Oklahoma Territory in 1896, he built his business and reputation for trustworthiness and dependability through consistent performance. These same timeless values have enabled Manhattan to grow and prosper into one of the most respected construction firms in the nation. The firm’s operating companies are Manhattan Construction Co., Cantera Concrete Co. and Manhattan Road & Bridge. Manhattan is recognized by Engineering News-Record as a top green builder, general builder and bridge builder in the nation. In the last two years Manhattan has received 50+ industry honors for quality and safety. The company’s services include Builder-Driven Pre-Construction®, construction management, general building, design-build and turn-key projects, and roads, bridges and civil works. The company works in the U.S., Mexico, Central America and the Caribbean. For more information about Manhattan, please visit: www.manhattanconstructiongroup.com or connect with us on twitter @ManhattanBuild, via Facebook/ManhattanConstruction and on LinkedIn. 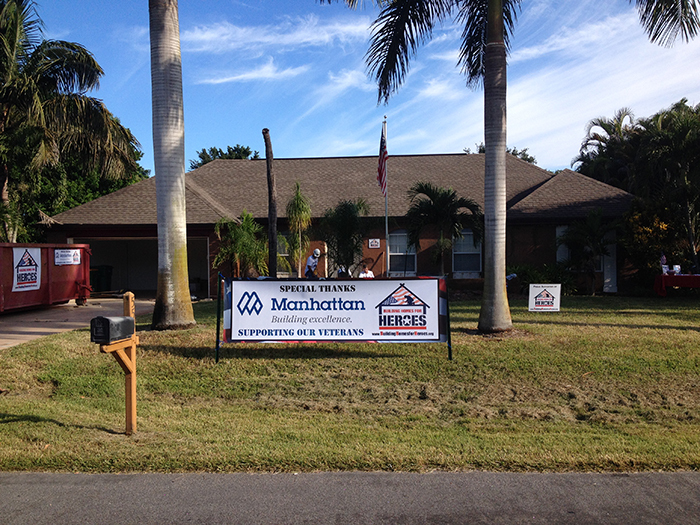 Naples, Fla. – Building Homes for Heroes, a national non-profit, non-partisan 501(c)(3) with offices in Valley Stream, N.Y. and Orlando, Fla., is pleased to announce a “hard hat day” to be held in conjunction with Manhattan Construction Company. The event will be held at 555 Nottingham Drive in Naples, Fla., the future home of Army Sergeant Brent Hernandez and family, on Wednesday, October 30 beginning at 10:00 a.m. The Hernandez family will be receiving a completely renovated, mortgage-free home through the partnership of Building Homes for Heroes and Chase bank. Manhattan Construction is recognized by Engineering News-Record as a top 20 general builder and in the last two years has received more than 50 industry honors for quality and safety. Sgt. Hernandez, who was deployed to the Zabuil Province of Afghanistan on March 28, 2010, was part of the 75th Ranger Regiment. Just 13 days into his deployment, he was severely wounded when his aircraft crashed. The pilot, flight engineer, an Army Ranger, and a civilian contract employee were killed, while 16 others were wounded. Hernandez sustained critical injuries including ripped intestines through his abdominal wall, three small bowel resections, two traumatic hernias, oblique muscles ripped in half and separated from his spine, three fractured ribs, a collapsed lung, two fractured vertebras, traumatic brain injury and post-traumatic stress disorder. Sergeant Hernandez earned the Army Achievement Medal, Good Conduct Medal (2 awards), National Defense Service Ribbon, Global War on Terrorism Ribbon, Army Service Ribbon, Army Ranger Tab, Combat Infantry Badge, and the Army Parachutist Badge. The beautiful three bedroom, two bathroom home will include specially-designed enhancements to help meet the needs and wishes of Hernandez and his family. Building Homes for Heroes, Inc. recognizes the tremendous sacrifices of the men and women of the United States Armed Forces by supporting the needs of severely wounded or disabled soldiers and their families. It is a national organization committed to supporting these brave men and women, with a goal to build homes for families in dire need. Manhattan’s services include Builder-Driven Pre-Construction®, construction management, general building, design-build and turn-key projects, and roads, bridges and civil works. The company works in the U.S., Mexico, Central America and the Caribbean. For more information visit: www.manhattanconstruction.com or connect with us @ManhattanBuild, via Facebook/ManhattanConstruction and on LinkedIn. 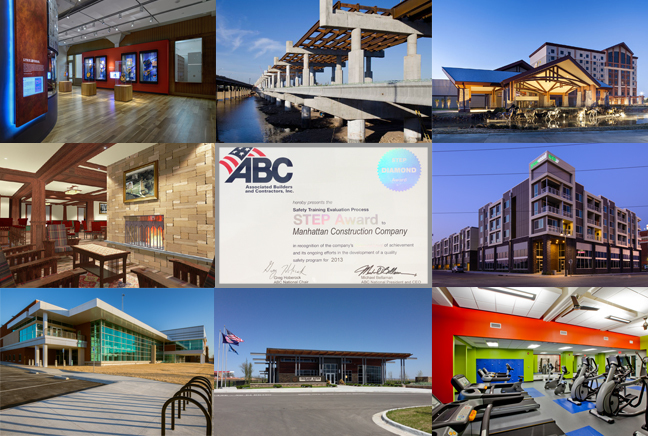 TULSA, Okla. – The Associated Builders Contractors (ABC) Oklahoma Chapter has honored Manhattan Construction Group’s subsidiaries with eleven Excellence In Construction Awards, and a Top National Safety Honor. Team members from Manhattan Construction Co., Manhattan Road and Bridge Co., and Cantera Concrete Co. were presented the honors at the ABC Excellence in Construction Awards Event Banquet held on Thursday, September 19th, 2013 at the Cox Business Center in Tulsa, Oklahoma. ABC’s Excellence in Construction program recognizes innovation, quality and vision by a building team. Projects are judged on a safety, personnel management, quality control, scheduling and degree of difficulty in completing a project. Manhattan Construction Co. received the ABC National STEP Diamond Safety Award – the highest honor in the Associated Builders and Contractors Safety Training and Evaluation Process (STEP) Awards program. This is the third consecutive year for Manhattan Construction Co. to earn this honor. GreenArch Apartments in Tulsa, Oklahoma in the “Residential/Multi-family & Condo” category. Bedré Chocolate Factory and Chickasaw Nation Welcome Center in Davis, Oklahoma in the “Industrial $5 to $14 million” category. Choctaw | Pocola Casino, in Pocola, Oklahoma in the “Renovation More than $10 million” category. Woody Guthrie Center/Tulsa Paper Company West in Tulsa, Oklahoma in the “Historical Renovation $2-$10 million” category. Oklahoma State Capitol Wellness Center in Oklahoma City, Oklahoma, in the “Institutional” category. OU Health Science Center Tunnel Expansion in Oklahoma City, Oklahoma in the “Industrial $2-$5 million” category. University of Oklahoma Jan Marie and Richard L. Crawford Faculty Club Renovation in Norman in the “Renovation $1-$10 million” category. Oklahoma City Crosstown Expressway I-40 West Connection from Agnew Ave. to Penn Ave. for the Oklahoma Department of Transportation in the “Infrastructure: Heavy — Bridge, Under $25 million” category. I-44 West Bound Double-Decker Replacement Bridge over the Arkansas River in Tulsa for the Oklahoma Department of Transportation in the “Infrastructure: Heavy- Bridge, over $25 million” category. Griffin Communications Media Center (KOTV) in Tulsa, Oklahoma in the “Other Specialty Construction – Concrete More Than $1 Million” category. Bedré Chocolate Factory and Chickasaw Nation Welcome Center in Davis, Oklahoma in the “Other Specialty Construction – Concrete More Than $1 Million” category. Click here to view a list of recent Manhattan Construction awards and honors. Click here to view Manhattan’s online project portfolio. 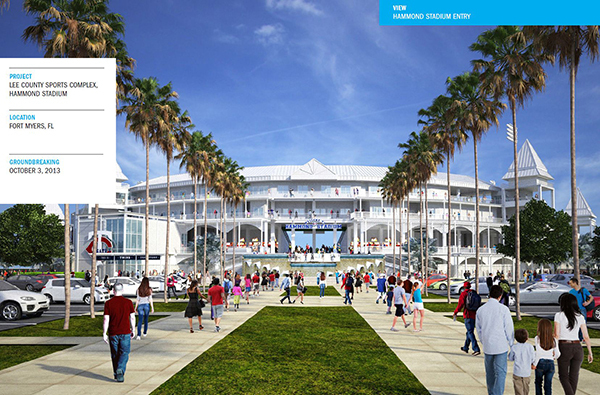 FORT MYERS, Fla. – Lee County and the Minnesota Twins have announced they will break ground on the $48.5 million renovations to the Lee County Sports Complex (LCSC) and Hammond Stadium today (Thursday, Oct. 3) at 3:00 p.m. ET. The LCSC serves as the Spring Training home of the Twins as well as the team’s year-round player development operations including the franchise’s Florida State League affiliate Fort Myers Miracle. Designed by Populous, a global sport and convention center architecture firm, the renovations will be completed in two phases. The player development academy elevates the facility beyond a traditional Spring Training facility with the goal of creating a year-round, multi-discipline, residential training center for players and staff. The residential component of the academy will be paid for by the Twins organization, which is contributing $6 million to cover that component and concessions equipment. The Twins have been training in Fort Myers at the Lee County Sports Complex since 1991. 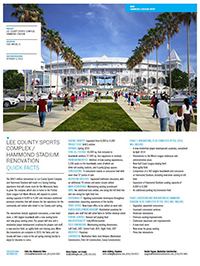 In November 2012, after more than 20 years of training in Fort Myers, the renovations were approved and the Twins signed a 30-year lease to remain at the Lee County Sports Complex. Each year, Spring Training games generate more than $47 million for Lee County, driving visitors to local attractions, restaurants, hotels and shopping. For more information about Manhattan, please visit: www.manhattanconstruction.com or connect with us on twitter @ManhattanBuild, via Facebook/ManhattanConstruction and on LinkedIn. You are currently browsing the archives for the Manhattan Road & Bridge category.